We all head into a new year with a lot of goals that we are totally motivated to accomplish. Finish the great American novel. Lose 20 pounds. Go to the gym more regularly. Land more new clients. Get out of debt. But … what generally begins with a big push generally ends up getting derailed by circumstances beyond our control. Stuff happens, after all. So, if you’re looking back on 2018 and trying to get a handle on what you actually did accomplish, you might find that some of your plans took a left turn here and there. And there may well have been good reasons for that, so don’t beat yourself up too much. Lack of clarity. Your plan may not have been executable because there wasn’t much thought put into it in the first place. Without a plan, you lay yourself open to distraction and having to jump on other priorities as they present themselves. Solution: Map out your path to success. Put it on the schedule. Prioritize it. Setting too lofty a goal. If your goal is largely unachievable by any standards, it’s not likely you will get there. Solution: If you want to increase your business, set a realistic goal of five percent growth. If you exceed it, celebrate! You’re a procrastinator. If your goal is going to be difficult and you’re a procrastinator by nature, you run the risk of putting it on the back burner only to reapply it to next year’s list of resolutions. Solution: Break difficult tasks down into smaller chunks and work them into your workflow in a comfortable way. Each step towards your goal will help you will gain the momentum you need to crack it open. Sometimes, we announce our goals without thinking about where the whole process is going to end up several years down the line. Connecting your immediate goals to a broader vision of the future helps to keep things in perspective. The ultimate goal may be unreachable in the short-term and things may change dramatically between now and then but being able to visualize the end result will help keep you on track – even if you have to readjust for market trends and other circumstances beyond your control. So, if the ultimate goal is 25 years from now, you’ll have to look at shorter increments of time to set milestones in between. 90-day intervals are doable chunks of time and, generally, you will be able to see energizing results based on your efforts, tweak your methodology, and move forward into the next 90 days with confidence. 90 days is enough time to accomplish a lot. It also provides a high level of clarity along with a sense of urgency. At the end of it, you will move on to the next 90-day goal with renewed purpose, taking yet another step forward towards your ultimate goal. 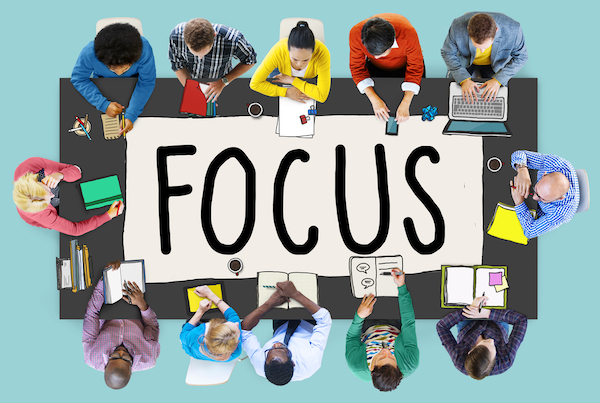 Do you have any tips for staying focused? We’d love to hear about them! If you are a small business owner or entrepreneur, reach out today to find out how we can help you grow.